We had our first acting/recording session for Bulwark on the 4th and our second one on the 12th. Both went extremely well. At this point, my main motivation for making this game is to do the performances justice. The actors were amazing. We have one more character who still needs a voice (and will be getting one soon! ), and after that I should be pretty much exclusively in editing mode. Slice the recordings into individual takes, putting the takes for each line in their own Reaper region. This is what I’m doing now. I’ve got 639 regions to fill, although that understates the amount of audio I’m dealing with, because some of those regions hold entire scenes. Choose the best take for every line. I’ll need to trim the clip to that take, cleaning out pops or other rogue sounds if necessary. Everyone did a great job controlling noise, though, so I don’t think much surgery will be required. For the non-branching scenes, mix in sound effects. These steps aren’t difficult. They just take a lot of time and attention. That comes with the territory, though. Sometimes I wish I’d fallen in love with a different style of project, because audio-first, story-heavy work is often tedious and expensive. Alas, it’s what I like. 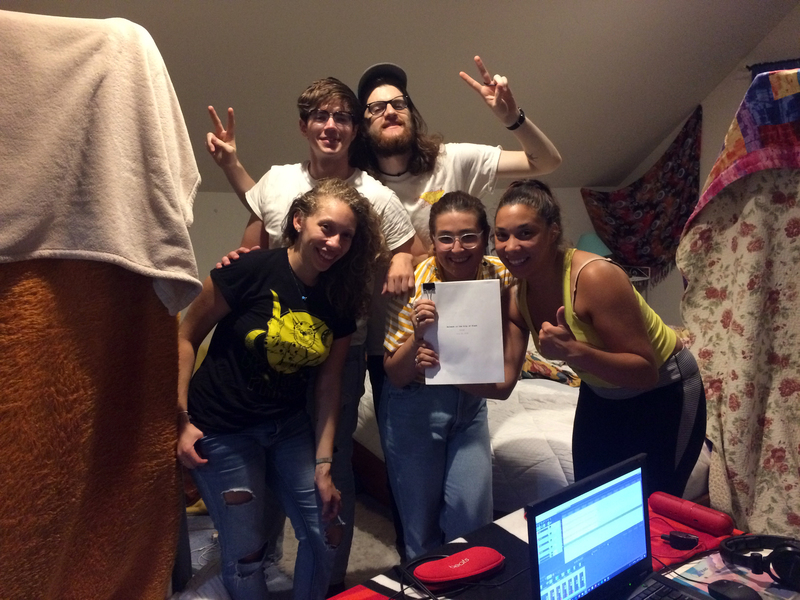 Below is a photo of the cast from Sunday, taken around midnight after a full day of sitting in hot, blanket-fort-style recording booths (which are visible on the left and right). Somehow, we never took a photo of Michelle during her recording session on the 4th, even though she voices the protagonist and has been with the project for over a year. She’ll just have to remain an enigma. The cast really did stun me. I can’t stand how much everyone poured their hearts into bringing their characters and this story to life. I’m so grateful to them, and I’ll be incredibly excited to hear their scenes once they’re cut together. Last week, my SIP team and I finished development on our mobile game, Lead the Light. The next team will handle the soft launch in the fall, and the team after that will handle the full launch in the spring. That’s a little off-topic for this diary, so suffice to say that I loved the project, my team, and all of SIP. I start my second semester of grad school in two weeks. I’m anxious about doing both it and Bulwark at the same time. I’ll try my hardest to finish Bulwark as soon as possible. That’s all I’ve got. Thanks for reading.